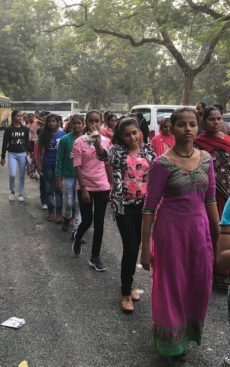 This school trip is closer to home: Qtub Minar. The Qutub Minar, also spelled as Qutab Minar, or Qutb Minar, is a minaret that forms part of the Qutab complex, a UNESCO World Heritage Site in the Mehrauli area of Delhi, India. 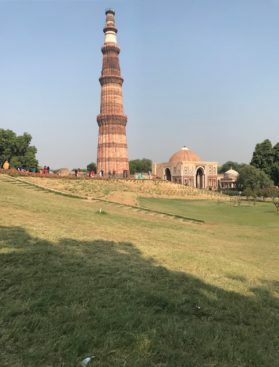 Qutub Minar is a 73-metre (239.5 feet) tall tapering tower of five storeys, with a 14.3 metres (47 feet) base diameter, reducing to 2.7 metres (9 feet) at the top of the peakIt contains a spiral staircase of 379 steps. Its design is thought to have been based on the Minaret of Jam, in western Afghanistan. There we met my husband Hein. 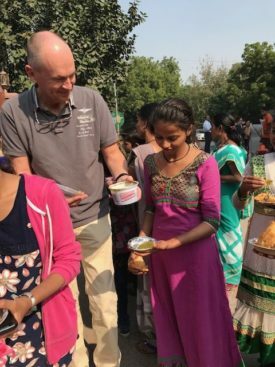 He was immediately put to work by Rani to hand out the sauce. There was a delicious samosa with sauce for everyone. 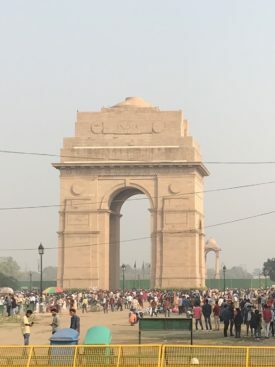 After this small pit stop we travelled by bus via India Gate to Delhi Zoo. Another fantastic day with all girls and most mothers.